If I am to be perfectly honest, I have read a numberless amount of books more than three times. I love rereading books–I love reliving those beloved stories and feelings. It feels like talking with an old friend. 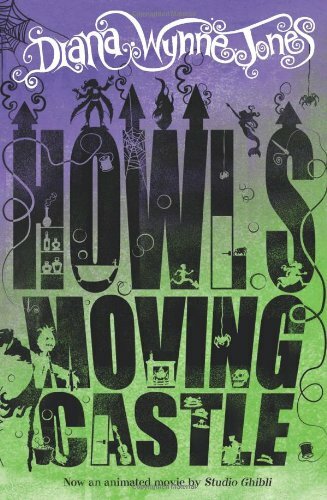 Having said that, I think the book I have read the most in my life is Howl’s Moving Castle by the impeccable Diana Wynne Jones. Many of you might be familiar with the anime by Studio Ghibli. While good, the anime is quite different from the novel it’s based on. (I have a list of complaints if you ever want to hear.) But if you haven’t read the novel, you’re doing yourself a great disservice. I do not know how to articulate what I love so well about Howl’s Moving Castle. I have written an eight-page paper on this novel trying to do that very thing (don’t worry, I’ll spare you), and still I cannot explain the deep affection I feel for this silly, wonderful book. Here are just a few reasons why this novel deserves all the love in the world. First of all, Diana (I call her Diana because I like to pretend we are best friends) perfectly satirizes the fantasy genre, while still crafting a story that fulfills all one’s fantasy needs. We have Sophie, the mousy eldest daughter so unaware of her own ability that she does not even realize when she enchants things; Howl, the slithery scoundrel of a wizard who’s too busy with his hair to see what a good person he is; and a myriad cast of other characters that are just as zany and magical and unexpected. Basically, Diana takes all the best tropes of fantasy fiction and blends them into a hilarious mess of an adventure. Despite the rather ridiculous circumstances of the novel, Diana creates characters that are still quite real and relatable. Sophie, for example, is an inspiration to me. At the beginning of the story, Sophie hides within her family’s hat shop, letting her sisters and (not so wicked) stepmother go and experience life outside their little town. Sophie doubts her abilities so much that convinces herself she is better off cursed as an old woman. Though being turned into an old woman is not exactly ideal, the curse ultimately frees Sophie and proves that the most powerful curses are the ones we put on ourselves. Howl, too, (despite all his Byronic, drama-queen-ness) can be so very human and it is just absolutely wonderful. AND THE HUMOR. This book cracks me up like no other. The comedy, I will say, is rather British and will not be everyone’s cup of tea. (Get it? Tea? Because, you know, the Brits drink a lot of tea … anyway.) As a self-professed Anglophile, though, I grin and cackle constantly throughout the novel. (The banter between Sophie and Howl and Calcifer gives me life.) Diana is so darn clever and always seems to know exactly what to write.